Stop the paper chase and discover more billable hours. Is your law firm or legal department still wrapped up in the paper chase? Are you still manually filing court cases (you don't have to, read about e-filing here) and hauling boxes of case materials to meetings and court dates? 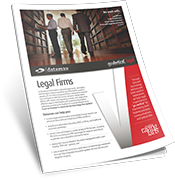 Technology can transform your legal practice from a manual, speed of paper operation to a streamlined and digitized machine. Case files at your fingertips. Printing and copying automatically tracked for fast and accurate charge back. Datamax Arkansas can work with you so that your documents work for you. Automate e-discovery and document workflows. Convert images and documents into PDF formats, including PDF/A for archival needs and searchable PDF for full-text keyword searches. Automate Bates Stamping with your digital copier. Get rid of filing cabinets and use that space for another office or conference room. 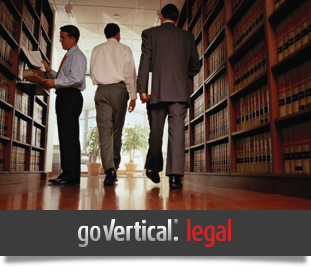 The legal industry can go Vertical® with Datamax with efficient workflow, faster communication, an an improved bottom line. Are you reading to decrease administrative costs and make case preparation faster? Let's talk. “If you are considering purchasing or leasing copy machines from Datamax, I recommend them without reservation. In December 2016, we replaced our fleet of Sharp copy machines with Canon copiers. The entire process from proposal through implementation was very smooth. At the beginning of the process, our Datamax representative, Dave, showed us how leasing a fleet of copiers would be more cost effective over time than buying the machines, the firm’s typical approach. Datamax monitored our copier usage for several months and then made “rightsized” machine recommendations in their proposal, reducing our need to 10 machines from 11, a definite cost savings. Datamax spent time in each department interviewing key users to clearly understand our processes and needs. Finally, and most impressive, was the easy transition to the new Canon copiers - our “live” date was simply a non-event. We heard so little from our users that we wondered if they were using the new machines! We credit this to the simple and intuitive interface on the Canon copiers. We’ve had little need for service calls on the Canon copiers but when we’ve requested service, Datamax response time and attention to detail have been excellent. Quarterly reviews have occurred as promised giving us the opportunity to understand our usage and showing trends that will help us make decisions regarding copy services, such as ensuring we have the right equipment in the right location. “I am writing this on behalf of Datamax in general and Kristy (our Sales Representative) specifically. I am a partner in our law firm and a customer of Datamax. In May of this year, we moved into a new office, a renovated Victorian. We had contacted all of our service providers, including Datamax, at least six weeks in advance, and each promised that service would be in place when we moved in. However, on the day we moved, the only service provider that fulfilled its service obligation was Datamax. Before our copier was delivered, Kristy came to our office to make sure it was delivered timely and professionally. The Datamax delive1y team showed up exactly when they said they would and got the machine up our narrow and steep stairway to the 2nd floor. We were up and running within ten minutes of delivery. Kristy then scheduled a meeting with one of their technicians regarding the use of the copier. After that, both Kristy and Senior Sales Manager David checked with us on a number of occasions making sure that we were satisfied with Datamax. David handled the transition from our old firm, which involved two new contracts, and he did so professionally and efficiently.